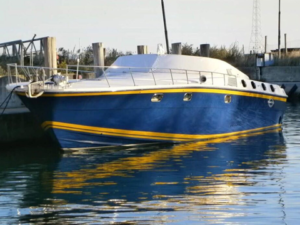 Today, we wanted to share three boat listings that were recently added to the Magnum Marine Brokerage section. Each one was produced during a different era in Magnum’s history. In 1966 Don Aronow, now offshore champion and boat builder, built himself a new 27′ race boat, which he named “Maltese Magnum”. The boat became World Champion and Don Aronow built a small factory to build more boats just like it: Magnum Marine was founded. 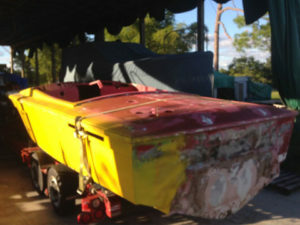 LISTING #1: 1967 28′ Race Boat (Donzi / Magnum). Clayton Rautboard from Chicago owned a very profitable photocopy company called Apeco, but his real passion was boat racing. He therefore bought Magnum Marine from Don Aronow in 1968. Apeco soon dropped the Missile and Marauder lines, which were not profitable, and continued building only the Magnum 27′ and Magnum 35′. Sales were strong. In 1976, Apeco sold Magnum Marine to Marchese Filippo Theodoli and his wife Katrin. This brought major change into the production line. 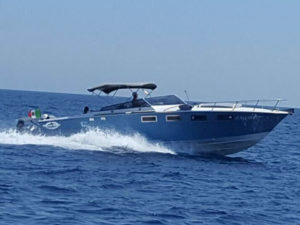 Filippo had the innovative idea of transforming the race boat into a high performance luxury yacht, combining sea worthiness of the race boat with the luxurious accommodations and comforts of a yacht, which the owner could drive by himself. He also insisted on reliability and fuel efficiency and, therefore, was the first to install diesel engines in a Magnum.